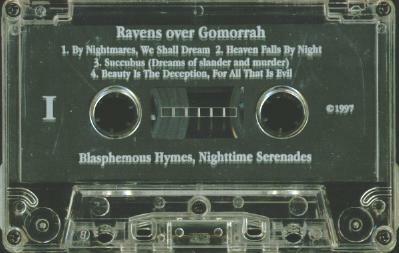 Ravens Over Gomorrah was a black metal band from Tustin (California). They released their first demo "Blasphemous Hymns, Nighttime Serenades" in 1997. Two more demos were released in 1999 and 2001 named respectively "Darkly Melisma" and "Deadcraft". Xerox cover with professionally made tape. At least two different cover were made for this demo.